• Content: Opera, ballet, original songs, comic stories, video art and animation projection. Bushpygmalion synthesizes 15 years of original concerts, comedy and theatrical performances. • Content: Incredible Music with Audiovisual elements and some quirky writing for an intriguing new piece of performance art. No classical cabaret here. 'Think of Sopranos & Butterflies and elegant creatures come to mind but this Diva has become the town nuisance! P’Opera*n. pl. P’ O·pe·ra (O-pr-, pr-) or pO·pus·es. 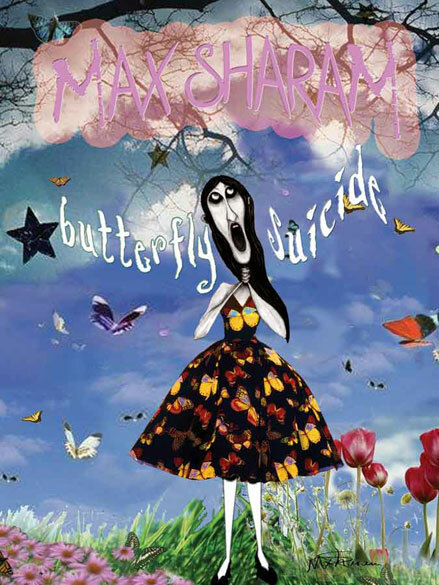 Coin Phrased by Max Sharam to describe her Virtual Variety and Multi-Media Musical. 1. A theatrical presentation in which a dramatic performance is set to a combination of classical music and projected images and sometimes found funny. 2. A contemporized, creative work, a musical composition numbered to designate the order of the composer's works in order to 'vent' using sick humor and spastic dance moves. A wacky theatrical exploration into the trials of an eccentric opera singer who falls into a fantasy existence and develops an obsession with butterflies after being turned away at an audition for Madam Butterfly. In the flashy, fancy world of butterflies and divas, the great masses of dowdy “true blues” are so common that most people overlook them - as would it be true for the ill soprano should she not have taken to the streets with her nightly bellowings. We map this monarch’s migration and metamorphosis across continents where she eventually lands in New York City and meets her end, on a Subway in Soho, finally making headlines worldwide. The only thing she knows how to Kook up is a storm. She's a lousy housewife. Her silicon breasts fall out of her unbuttoned red gingham housefrau frock, she spills wine - and song and cleavage - and unrehearsed honesty everywhere. The living picture of Hitchcock-esque Kitsch. But God love her. We don't know who else will. "Show us your sox! "- cry the crowd. "100% cashmere. Knee high", she coughs - she has a frog in her throat? She's been known to kiss the odd frog... She likes sauteéd reindeer, snails and frog legs in white wine? Oh dear. She has a serious drinking problem. • Content: Charades, Shadow Puppets, ballet, original songs, comic stories, parody and foul play. Max's one-woman show ran all through April - 6 shows a week. ©Max Sharam. All rights reserved.